Friday is going to be a gonzo night for stargazers. No, it's not another supermoon; it's an odd confluence of events that you won't see often. There will be a full moon (the so-called "snow" moon), a lunar eclipse, and a comet flyby on the same night. If you're looking up, you'll catch a penumbral lunar eclipse early in the night. 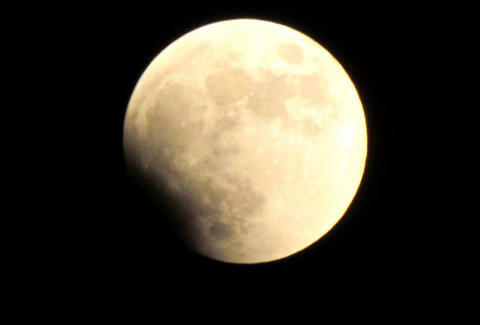 A penumbral lunar eclipse occurs when the moon passes through the Earth's outer shadow, also known as the penumbra. In the outer shadow, most of the sun's light is blocked. Since it's not blocking all of it, the moon will still reflect some light, giving it a dark gray color opposed to the total blackout of a full lunar eclipse. NASA has said the eclipse will peak at 7:43 p.m E.T., which has the eclipse occurring just at moonrise for most of North America. It may be seen to be shaded gray as early as 6:14 p.m. Of course, as is the case with any eclipse, the moon will be full. Not too long after the eclipse, Comet 45P/Honda-Mrkos-Pajdusáková will make its closest approach to Earth. Though it's been visible in the sky for the last couple months using binoculars or a telescope, under clear conditions it will be visible to the naked eye as it passes just 7.4 million miles from where you stand. The comet will be at its closest around 10:30 p.m. E.T. Around 3 a.m., the comet and it's blue-green glow will be visible near the constellation Hercules. It'll remain in view to telescopes until the end of the month and then not again until 2022 when it passes by once again. Though, if you can't be bothered to taste fresh air, Slooh will be live-streaming the eclipse and some good views of the comet, which will give you a look through a telescope.